MNF-Iraq is reporting the death of a Multi-National Division–Baghdad Soldier from a non-combat related vehicle accident in an undisclosed location in Iraq on Friday, October 30th. MNF-Iraq is reporting the death of a Multi-National Division-South from non-combat related injuries in an undisclosed location in Iraq on Friday, October 30th. The DoD is reporting a new death previously unreported by the military. Spc. Robert K. Charlton died at Landstuhl Regional Medical Center on Tuesday, October 27th, from a non-combat related incident in Wardak, Afghanistan, on Friday, October 23rd. The DND/CF is reporting the death of a Canadian ISAF soldier in an IED attack 10 km south-west of Kandahar City, Kandahar Province, Afghanistan on Friday, October 30th. No other soldiers were injured in this incident. #1: An improvised explosive device attached to a passenger vehicle went off in central Baghdad on Saturday, leaving six civilians wounded, an Iraqi police source said. “Six civilians were wounded when an IED attached to a passenger vehicle went off at Damash area, on the al-Muthanna airport road, central Baghdad, today (Oct. 31),” the source told Aswat al-Iraq news agency. #2: A bomb attached to a car killed an employee of the Justice Ministry and wounded three people in south Baghdad's Saidiya district on Friday, police said. #1: Three civilians and one soldier were injured when a roadside bomb exploded near an Iraqi army checkpoint in Al Youssifiyah town south of Baghdad on Friday. #1: Police patrols on Friday found the body of an unidentified young man in a remote farmland in al-Shurqat district, according to a local administration source in Salah al-Din. “The body, of a young man in his mid-20s showed signs of having been slain at throat by a knife. The policemen found it in a remote plantation area near a spot where cattle are sold in the area of al-Shurqat,” the source told Aswat al-Iraq news agency. #1: A magnetic bomb stuck to the car of an off-duty policeman exploded killing the policeman in Tel Afar west of Mosul. #1: Suspected Taliban militants set off a roadside bomb that killed seven paramilitary soldiers Saturday in a rugged tribal region of northwestern Pakistan. On Saturday, the paramilitary soldiers were traveling through the Khyber region, famed for the pass that is the main route for ferrying supplies to U.S. and NATO forces in Afghanistan, when the bomb went off, said local official Ghulam Farooq Khan. The men died before they reached a hospital. #2: Pakistani jets bombed three hideouts of Pakistani Taliban leader Hakimullah Mehsud in the Orkazai tribal region, killing at least eight militants and wounding several others, intelligence officials said. Another airstrike, about 43 miles (70 kilometers) from the first one and near the Afghan border, killed seven militants in the Kurram tribal region, the officials said. #3: Three Afghan police sustained injuries as a roadside bomb struck their vehicle in Taliban birthplace Kandahar in south Afghanistan, provincial police chief Sardar Mohammad Zazi said Saturday. "The gruesome incident took place Friday on the way to Kandahar airport wounding three policemen," Zazi told Xinhua. There were no ISAF casualties in the past 24 hours. #1: Five civilians were wounded when a roadside bomb detonated targeting civilians in Palestine Street in east Baghdad around 6 p.m. Thursday. #2: A senior police officer on a team investigating two high-profile bombings was found shot dead in his office, police said. #1: A rocket landed south of the city of Kirkuk on Thursday but did not explode, a source from the city’s Joint Coordination Center (JCS) said. “An unidentified rocket landed in the area of Huzayran 1 but did not explode,” the source told Aswat al-Iraq news agency. #1: Three policemen were killed and an officer wounded in an attack by unidentified gunmen on a checkpoint in western Mosul city on Thursday, a local security source said. “Unidentified gunmen attacked a checkpoint of the 1st Emergency Police Contingent in al-Amil district, western Mosul, killing three personnel and wounding an officer in the rank of captain,” the source told Aswat al-Iraq news agency. “The attacking gunmen used bombs and guns,” the source added, not giving further details about the incident. #2: On Thursday afternoon, two gunmen opened fire upon a policeman in Al-Karama neighborhood in east Mosul. The policeman fired back the gunmen wounding one of them while the other one run. #3: Police found the bullet-ridden body of man carrying a Kurdish police badge west of Mosul, 390 km (240 miles) north of Baghdad, police said. #1: Three people, including a policeman, were wounded on Friday in a sticky bomb explosion in north of Talafar, a medical source said. “The explosion occurred in al-Nekhwa neighborhood in north of Talafar,” the source told Aswat al-Iraq news agency, noting that they were rushed to the Talafar hospital for treatment. #1: A civilian man was wounded when an improvised explosive device attached to his vehicle went off in central Ramadi city on Thursday, a local police source said. “The man, an employee of the Anbar Investment Department of the name Ahmed al-Dulaimi, was wounded when an IED attached to his vehicle went off while he was driving by,” the source told Aswat al-Iraq news agency. #1: Pakistani forces killed two dozen militants in 24 hours and were closing in on a prominent insurgent stronghold in the mountains of South Waziristan, the army said Friday. Government soldiers now control the hills above the village of Sararogha, where Taliban leaders long have operated openly, officials said in a statement. The army said during the advance two Pakistani soldiers were killed in a militant mortar attack and three were injured in a bombing. #2: A roadside bomb killed eight civilians in eastern Afghanistan on Friday, officials said. In Nangarhar, a Reuters witness said a car was being driven through a dry river bed when it was hit by the bomb. Villagers said a tribal elder who was a passenger in the car appeared to be the target of attack. A woman was among those killed, the Interior Ministry said in a statement. MNF-Iraq is reporting the death of a 13th Sustainment Command (Expeditionary) soldier from a non-combat related injury at at Camp Adder, Iraq (20 k. sw. of An Nasiriyah) on Wednesday, October 28th. The AP is reporting the death of an American soldier in an "accident" somewhere in Kuwait on Thursday, October 29th. The DND/CF is reporting the death of a Canadian ISAF soldier in an IED attack 20 kilometres south-west of Kandahar City, Kandahar province, Afghanistan on Wednesday, October 28th. Two additional soldiers were wounded in the attack. NATO is reporting the death of a second ISAF soldier in an IED attack in an undisclosed location in southern Afghanistan on Thursday, October 28th. We suspect this is an American. #1: Three civilians were killed and four others wounded when an improvised explosive device went off near a passenger vehicle in eastern Baghdad on Wednesday, police said. “An IED attached to a passenger vehicle went off near al-Baladiyat intersection in eastern Baghdad, leaving three persons, including two women, killed and four others wounded,” the source told Aswat al-Iraq news agency. #1: A suicide car bomber struck a U.S. patrol in the city of Baquba, the capital of Diyala province on Thursday, killing at least a civilian and wounding two others, a provincial police source said. The suicide bomber blew up an explosive-laden car near a U.S. military patrol near the al-Batool Hospital in eastern Baquba, some 65 km northeast of Baghdad, the source told Xinhua on condition of anonymity. Two U.S. vehicles were damaged by the blast, the source said, but he could not tell whether the U.S. soldiers sustained any casualty as the troop immediately sealed off the scene. The death toll among civilians from the suicide attack could rise, he said, adding that the powerful blast also caused damages to the hospital building. The U.S. military has no immediate comment on the incident. #2: Two policemen were wounded when an improvised explosive device went off in Jalawlaa district on Wednesday, according to a local security source. “An IED planted by unidentified persons in the area of Tabaj, Jalawlaa, (30 km) southwest of Khanaqin, went off just as a police patrol was driving by, leaving two policemen wounded,” the source told Aswat al-Iraq news agency. #3: Gunmen assassinated the chief of the sahwa (awakening) tribal forces in Umm al-Nakhl area, north of the city of Baaquba, on Wednesday, an official security source in Diala said. “Gunmen suspected members of Al-Qaeda in Iraq (AQI) network intercepted Abdulsattar al-Tai’e, the chief of the sahwa forces in Umm al-Nakhl, al-Khalis district, (15 km) north of Baaquba, and showered him with bullets, killing him instantly,” the source told Aswat al-Iraq news agency. #1: Policemen in Missan defused three improvised explosive devices in central al-Amara city on Wednesday, a local security official said. “Personnel from the Missan Emergency Police Department dismantled three IEDs that were planted on the roadside in al-Hussein neighborhood, central Amara,” Col. Sadeq Sallam, the director of the Missan police relations & information department, told Aswat al-Iraq news agency. #1: An official of the Samarra sahwa (awakening) tribal forces survived an assassination attempt with an improvised explosive device attached to his vehicle east of the city on Wednesday, a sahwa source said. “Raheem Muzieb al-Bazi, the official in charge of al-Jabiriya sahwa forces, east of Samarra, escaped the attempt as the IED went off after he went out of his car and entered his house,” the source told Aswat al-Iraq news agency. “The blast left a woman who happened to be near the site wounded. #1: An improvised explosive device went off Thursday in central Kirkuk without causing damage, a source from the joint coordination center said. “The bomb exploded on Thursday (Oct. 29) in al-Quds street, behind al-Mansour mosque, central Kirkuk, without causing casualties or material damage,” the source told Aswat al-Iraq news agency. #1: Four people were killed and six others were wounded including one policeman by a roadside bomb that targeted an Iraqi army patrol in North bus station in east Mosul at around 10:30 a.m. Wednesday. #1: A suicide bomber was killed on Thursday in an explosive belt blast in northern Talafar, an army source said. “The bomber was killed in the small hours of Thursday (Oct. 29) when an explosive belt, which he was attempting to put it on, went off inside his house in al-Salam neighborhood in northern Talafar,” Colonel Shehab Ahmad told Aswat al-Iraq news agency. #2: Meanwhile, Talafar police chief, Colonel Ali Hadi Ubeid, told Aswat al-Iraq news agency that unknown gunmen attacked a policeman yesterday night in front of his house in Alwa village, northern Talafar, using light weapons, killing him instantly. #1-5: Pakistani security forces killed 11 more militants during the last 24 hours, bringing the total fatality to over 280, as the operation in the country's tribal area steadily progressed towards the Taliban strongholds in South Waziristan, the amy said Thursday in a daily press release. The army said one soldier was killed and another two security forces personnel were injured in clashes in the last 24 hours during the ground assault in various areas in the tribal agency near the border with Afghanistan. #1: In the operation coded as Rah-e-Nijat, or path of salvation, the security forces continued shelling on extremists hideouts on main Jandola-Sararogha axis, Shakai-Kaniguram axis and Razmak-Makeen axis, the army said. #2: On Jandola-Sararogha axis, the security forces are consolidating their positions along the main axis Kotkai-Sararogha and the important town of Inzar Kalay has been fully sanitized and cleared of mines, improvised explosive devices and bobby traps, according to the press release. #3: On Shakai-Kaniguram axis, the security forces are expanding their perimeter of security and closing in towards Kaniguram from east and west. #4: On Razmak-Makeen axis, the security forces successfully moved forward after fully securing Sharakai Sar and secured Pakalita and Manza Sar feature North East of village China. #5: In the ending operation in Swat and Malakand, the army said, the security arrested four suspects and recovered vehicle of terrorist commander Hussain with driver from Ballogram near Mingora. #6: Clash between Taliban and police in Ghazni province south of Afghanistan left six insurgents dead, a private television channel reported Thursday. "Six Taliban insurgents were killed in clash with police in Gero district last night," Tolo television aired in its bulletin. The television quoting local officials also reported that one police constable was injured in the firefight. Earlier authorities reported that 25 Taliban insurgents were killed in Badghis province. #7: Finnish peacekeepers serving in Afghanistan have again come under fire. No injuries were reported in the incident. A group of Swedish and Finnish peacekeepers were on patrol with Afghan police and troops in the western part of the country at the time. After the initial assault, peacekeepers came under fire in the ensuing gun battle which lasted for several hours. Both the peacekeepers and Afghan officials responded with hand gun fire backed by air support. The incident took place early Thursday morning some 160 kilometres distant from Mazar-I-Sharif. MNF-Iraq is reporting the death of a Multi-National Corps - Iraq soldier from a non-combat related injury at Camp Victory in Baghdad, Iraq on Tuesday, October 27th. #1: Six civilians were injured when a roadside bomb went off in northwestern Baghdad, a source from the Iraqi police said on Wednesday. “The incident took place at al-Hurriya neighborhood,” the source told Aswat al-Iraq news agency. #2: A roadside bomb wounded three civilians and a policeman guarding a state-run flour mill in northern Baghdad, police said. #1: A roadside bomb blew up an oil tanker, killing the driver and his assistant, on Tuesday near Tikrit, 150 km (95 miles) north of Baghdad, police said. #1: Police forces defused a sticky bomb at the gate of the Ninewa provincial authority’s building in Mosul city, a security source from Ninewa said on Wednesday. “The bomb was attached to the car of Major Ziyad Mohammed, the communication director,” the source told Aswat al-Iraq news agency. #2: Three civilians were killed, four others were wounded, and one soldier was injured when a roadside bomb went off on Wednesday in eastern Mosul. “The blast took place in Garaj al-Shemal neighborhood,” said a security source from Ninewa province. He said that the attack targeted an Iraqi army patrol. 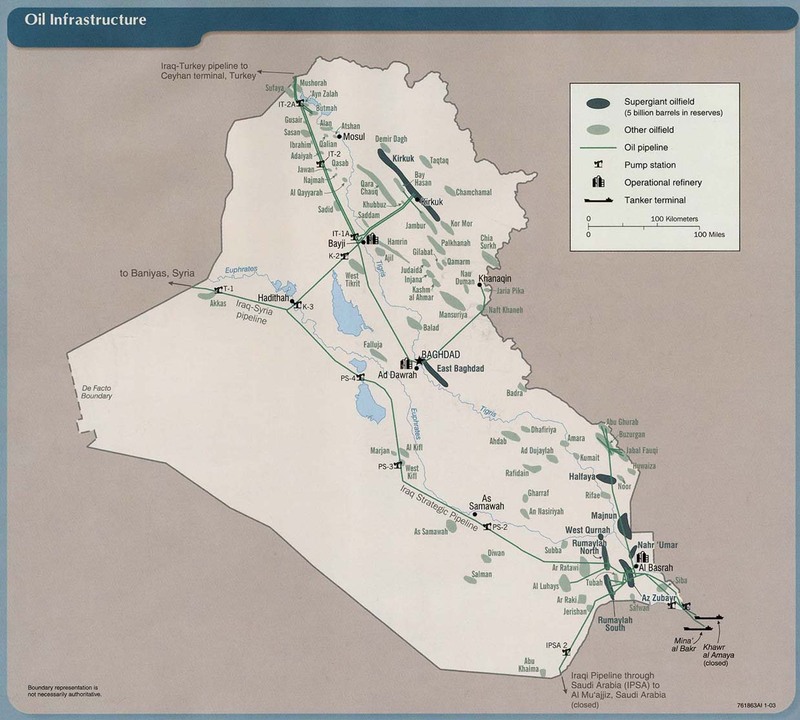 #3: The Kirkuk pipeline that takes crude from northern Iraq to the Turkish port of Ceyhan was damaged on Monday morning by an explosion caused by "sabotage action," an engineer with Iraq's North Oil Company said. The engineer, who asked not to be identified, said the blast happened near Mosul. #4: Iraqi security forces backed by U.S. forces killed a suspected al Qaeda member and arrested five others on Tuesday west of Mosul, the U.S. military said in a statement. #1: A roadside bomb went off on Tuesday targeting a police patrol at al-Dhobat neighborhood, eastern Falluja, without leaving casualties, said a police source from the city. “The blast damaged one of the patrol’s vehicles,” the source told Aswat al-Iraq news agency. #1: Taliban militants wearing suicide vests and police uniforms stormed a guest house used by U.N. staff in the heart of the Afghan capital early Wednesday, killing 12 people — including six U.N. staff. It was the biggest in a series of attacks intended to undermine next month's presidential runoff election. One of the six U.N. dead was an American, the U.S. Embassy said. .N. spokesman Adrian Edwards said six U.N. staff were killed and nine other U.N. employees were wounded in the assault, which began about dawn in the Shar-e-Naw area of the city. Terrified guests fled the building during the assault — some screaming for help and others jumping from upper floors as flames engulfed part of the three-story building. Afghan police and U.N. officials said 12 people in all were killed, including the U.N. staff, three attackers, two security guards and an Afghan civilian. which also included rocket attacks at the presidential palace and the city's main luxury hotel. One rocket struck the "outer limit" of the presidential palace but caused no casualties, presidential spokesman Humayun Hamidzada said. Another slammed into the grounds of the Serena Hotel, which is favored by many foreigners. The device failed to explode but filled the hotel lobby with smoke, forcing guests and employees to flee to the basement, according to an Afghan witness who asked that his name not be used for security reasons. #2: A powerful car bomb ripped through a bustling marketplace in Peshawar Wednesday, killing at least 90 people -- most of them women -- a government official said. The blast at the Meena Bazaar injured more than 200 others, according to North West Frontier Province's information minister. The market is a labyrinth of shops popular with women in the Peepal Mandi section of the city. #3: A Minnesota native has died in the crash of a U.S. Army reconnaissance plane in Afghanistan. Pilot Randy Bergquist was killed along with two other American military contractors when the Army C-12 Huron twin-engine turboprop crashed two weeks ago in a rugged, mountainous area of northeastern Afghanistan. The British MoD is reporting the death of an ISAF soldier at Selly Oak Hospital, England on Sunday, October 25th. The soldier was originally wounded in an IED attack in Kandahar province on Tuesday, September 15th. The Washington Post is reporting the deaths of eight American ISAF "troops" in multiple complex bomb attacks in undisclosed locations in southern Afghanistan on Tuesday, October 27th. One Afghani civilian was also killed and "several" other soldiers ware wounded in the attacks. #1: Police forces defused two explosive charges in central Mosul on Monday, a police source said. “A police force managed to defuse a bomb, which was placed under the social security network department near the Ninewa provincial council in central Mosul, without damage,” the source told Aswat al-Iraq news agency. “The same force defused another explosive device, placed near the first bomb,” he added. #2: Gunmen riding bicycles opened fire killing a young Turkoman in west Mosul on Monday morning. #3: U.S. forces killed a civilian and arrested four of his brothers in west of Mosul on Tuesday, according to a security source. “U.S. troops raided Tuesday morning (Oct. 27) a house in Tal Zalat village, west of Mosul, where they killed a civilian and arrested four of his brothers,” the source told Aswat al-Iraq news agency. #4: Unknown gunmen shot and killed a civilian in Bab al-Saray market in central Mosul,” the source told Aswat al-Iraq news agency. #5: Another civilian was killed by gunmen in al-Sergkhana region, central Mosul,” he added. #1: Three policemen and one civilian were wounded by a roadside bomb that targeted the Iraqi police in downtown Falluja city on Monday afternoon. #1: A brigadier escaped assassination Tuesday in Islamabad. No one was hurt in the Islamabad attack. "Brigadier Waqar Ahmed, who was posted at GHQ, was accompanied by his mother and driver and was going to a local hospital when terrorists fired bullets on him," police officer Khurshid Khan told a foreign news agency. "Luckily all of them survived," he said. #2: Pakistan's army pushed deeper into a Taliban sanctuary close to the Afghan border Tuesday, killing 42 alleged militants in the latest stage of an offensive against extremists blamed for surging suicide attacks. An army statement said troops were progressing well on three fronts in South Waziristan, but were meeting resistance. It said over the last 24 hours, at least 42 militants and one solider had been killed. #3: Taliban militants laid ambush on police patrol in Zabul province south of Afghanistan, leaving five policemen dead, a senior police officer General Abdul Razeq said Tuesday, Xinhua reported. "Militants opened fire on police when they were on patrol in Shumanzai district Tuesday night, killing five policemen," Razeq told Xinhua. He added that four militants were also killed in the gun battle lasted for a while. NATO is reporting the death of two U.S. ISAF service members in a roadside bombing in an undisclosed location in southern Afghanistan on Friday, October 23rd. The Danish Defense Ministry is reporting the death of a Danish ISAF soldier from hostile fire - gunshot wounds in the area around Gereshk town, Helmand province on Friday October 23rd. NATO is reporting the deaths of four U.S. ISAF service members from a mid air collision and crash of two helicopters in an undisclosed location in southern Afghanistan on Monday, October 26th. Two additional soldiers were wounded in the crash. NATO is reporting the deaths of Seven U.S. ISAF service members in a helicopter crash in an undisclosed location in western Afghanistan on Monday, October 26th. Three American civilians also died and eleven U.S. service members and fourteen Afghani soldiers were wounded in the crash. NATO is reporting the death of a U.S. service member in an IED attack in an undisclosed area in eastern Afghanistan on Sunday, October 25th. #1: update The number of people killed in Sunday's twin car bomb blasts in Baghdad has risen to 155, with more than 500 wounded. The suicide bombings, near the Justice Ministry and city government offices. #1: One U.S. vehicle was damaged in a roadside bomb explosion in the south of Kut city on Sunday, according to a security source. “An improvised explosive device went off Sunday (Oct. 25) targeting a U.S. military convoy in south of Kut, damaging one of its vehicles,” the source told Aswat al-Ira news agency. “The explosion occurred when the convoy was coming from al-Hai district toward Kut,” he noted. No word was immediately available from the U.S. army on the incident. #1: A bomb planted in a mini-bus killed three people and wounded eight at the northern entrance to Kerbala, 80 km (50 miles) southwest of Baghdad, police said. #1: Policemen seized three Katyusha missiles ready for firing towards vital installations and six launching pads in western Basra on Monday, a local police source said. 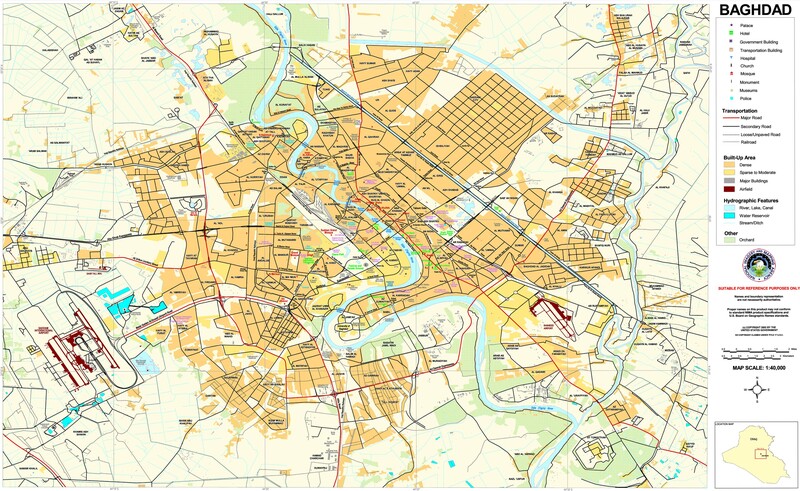 “Security forces, acting upon intelligence tip-offs, seized three Katyusha rockets of 107 mm. caliber that were ready for firing at vital facilities in the area of Safwan, (60 km) western Basra, and deactivated them,” the source told Aswat al-Iraq news agency. #1: The body of a kidnapped person was found, while a suspected gunman was arrested in two separate incidents in Kirkuk, a source from the joint coordination center said on Sunday. “A police force found a body in al-Shourga region near the Olympic Stadium in northern Kirkuk,” the source told Aswat al-Iraq news agency. “The body belongs to Ghassan Mohammad Saleh, who was kidnapped on Friday (Oct. 23),” he added, noting that the body bore signs of gunshot wounds to the head. #2: A student in the preparatory stage of education was kidnapped by unidentified persons in southern Kirkuk on Monday morning in a second copycat incident in less than a week, a local police official in the city said. “An armed group in a vehicle with an unknown number plate kidnapped a 17-year-old boy in the al-Nasr neighborhood, southern Kirkuk, while on his way to his preparatory school,” Col. Shirzad Muwaferi told Aswat al-Iraq news agency. “The kidnapped boy is the son of a rich notable in the city. Watching him being kidnapped, a colleague of his tried to use his cell phone to report to the police but the gunmen snatched it away and escaped,” he added. #1: Two civilians were killed and two others wounded when gunmen attacked a building in eastern Mosul city, a security source in Ninewa police said on Monday. “Unidentified gunmen raided a small building belonging to a power generator in al-Ikhaa neighborhood, eastern Mosul, and shot dead the owner and a friend of his and wounded two others before escaping to an unknown place,” the source told Aswat al-Iraq news agency. #2: A civilian man was wounded when an improvised explosive device went off east of Mosul city on Monday, according to a Ninewa police source. “The IED, which was attached to a civilian man’s vehicle, went off in the district of Bartala, (30 km) east of Mosul, leaving him wounded,” the source told Aswat al-Iraq news agency. #1: Policemen defused an improvised explosive device planted on a roadside near a residential compound in western al-Ramadi city without incident on Monday, a local police source said. “Intelligence tip-offs led security forces to a roadside IED near a residential compound in western Ramadi. The area was sealed off from two directions as the bomb squad personnel defused the charge without incident,” the source told Aswat al-Iraq news agency. #1: Militant attacks killed six Pakistani security officers on Monday. Militants assaulted security officials in Toraware village overnight, killing two and wounding four in a three-hour shootout in the area some 60 miles (95 kilometers) north of South Waziristan, police officer Mir Chaman Khan said. Some 10 insurgents were believed to have been killed. In Bajur, a tribal region further north, Taliban fighters attacked a checkpoint at Matthak village, killing four security officials. Seven militants died in the clash, said Syed Ghulam Rasool, a local government official. The militants also attacked security check posts at Khar, the main town in Bajur, and Siddiqabad, an adjoining village, wounding at least three security personnel. #2: The governor of Afghanistan's eastern Nangarhar province survived an assassination attempt on Monday which saw one of his attackers gunned down in a shoot-out, an official said. Two gunmen armed with AK-47 machine guns and hand grenades carried out the attack at an information technology conference near the governor's office in the city of Jalalabad, said a provincial government spokesman. As Governor Gul Agha Sherzai arrived at the venue's entrance in his motorcade, one of the attackers dropped a hand grenade from a second-floor window, Ahmad Zai Abdulzai said. The provincial hospital told AFP that one policeman was also wounded in the attack. The medias are occupied with reporting the aftermath of the bombings in Baghdad and the three choppers which crashed in Afghanistan so there seems to be little else being reported from those regions. Sorry I missed Saturday but after six years of working of our wars documentation I have learned to take a break from time to time to keep from going insane from over focus of the continuing stupidity of these undeclared wars. Rescuers search for bodies at the damaged building of the Ministry of Justice in Baghdad October 25, 2009. REUTERS/Mohammed Ameen I show this photo as an indication of the power of the bomb. In this image from an amateur video a man runs from the blast as one of two huge car bombs explode in central Baghdad Sunday Oct 25 2009. The bombs killed at least 91 people in an apparent attempt to target the fragile city's government offices, Iraqi medical officials and authorities said. Sunday's explosions, which also injured at least 250 people, went off less than a minute apart near two prominent government institutions — the Ministry of Justice and the headquarters of the Baghdad provincial administration — in a neighborhood that houses a number of government institutions. Reported death toll stands at 91 in twin car bombings near the Baghdad provincial administration and the Ministry of Justice building at approximately 10:30 am local time. Reported death tolls vary wildly, as always in the immediate aftermath of such events, but latest reports are all in the range of 90 and more. The Chinese embassy was also damaged in the explosion. Euronews reports that flooding from damaged water mains hampered rescue operations, and that firefighters were using ladders to reach upper floors of buildings where they feared victims might be trapped. Emergency services overwhelmed; civilian vehicles transported wounded to hospitals. Prashan Rao for Middle East Online also offers a fairly detailed report, giving the toll of wounded as 600. IED ttack on "MNF" (i.e. U.S.) patrol causes no casualties. Owner of a real estate office is killed by unidentified gunmen. A court in Diyala province issues an arrest warrant for Sunni MP Tayseer al-Mashhadani and her husband, on allegations of financing sectarian violence. Mashhadani is a member of the Iraqi Accordance Front, which denies the allegations and claims they are politically motivated. U.S. Ambassador to the United Nations Susan Rice meets with Kurdish president Masaod Barazani, apparently to encourage progress on the January elections. Member of U.S. military killed in southern Afghanistan. No further details available. Thousands demonstrate in Kabul in response to alleged desecration of a Quran by foreign troops in Maidan Wardak province. ISAF says this is a false allegation being promulgated by the Taliban. And once again, ISAF is probing reports of civilian deaths, this time four people killed when troops fired on a vehicle in Kandahar. Two women and a child are said to be among the dead. It is always the poor man who takes a bullet and gets no credit for it. Retired Peshmerga Abdulla Mohammed, now reduced to selling candy on the streets. The British MoD is reporting the death of a British ISAF soldier in an IED attack in the Gereshk district, Helmand province, Afghanistan on Thursday, October 22nd. #1: Four persons, including a policeman, were wounded on Thursday in a bomb explosion in southeastern Baghdad, a police source said. “A sticky bomb, placed inside a civilian vehicle, went off Thursday afternoon (Oct. 22) in Jisr Diala region, southeastern Baghdad, killing 3 civilians and a policeman. #1: Unknown gunmen opened fire on a civilian car in al-Nada region, southern Khanaqin, northeast of Baaquba, injuring two civilians,” the source told Aswat al-Iraq news agency, noting that one of them was in a critical condition. #1: An improvised explosive device went off Friday targeting a police vehicle patrol in southwestern Kirkuk, without leaving casualties, a source from the joint coordination center said. #1: A policeman and a gunman were killed in clashes that erupted in western Mosul city on Thursday, a security source in the Ninewa police said. “The two were killed in clashes between security forces and gunmen in Nabuls neighborhood, western Mosul,” the source told Aswat al-Iraq news agency. #2: An improvised explosive device went off near a police patrol in New Mosul, in the western part of the city, leaving one policeman killed on Thursday. #3: Another IED went off near a security patrol in al-Majmoua’a al-Thaqafiya area, northern Mosul, leaving three civilians who happened to be near the blast scene wounded,” the source added. “A retired major general of the former Iraqi army was among the wounded,” the source added. #1: A suicide bomber killed seven people near a major air force complex in northwest Pakistan on Friday. A lone suicide bomber on a bicycle blew himself up at a checkpoint on a road leading to the complex, about 30 miles (50 kilometers) from the capital, Islamabad. Police officer Akbar Abbas blamed the Taliban for the attack. The seven dead included two troops. Some 13 people were wounded. #2: Hours later, a blast struck the bus, which was traveling in the Mohmand tribal region. Four women and three children were among the 17 killed, said Zabit Khan, a local government official, who said the exact cause of the blast was still not certain. "It appears to be a remote-controlled bomb, and militants might have hit the bus mistakenly," Khan told The Associated Press. #3: Also Friday, a car bomb exploded in the parking lot of a recreational facility in Peshawar, the main city in the northwest. Fifteen people were wounded. The facility includes a restaurant, a swimming pool, a health club and a marriage hall. #4: A military statement Friday reported two more soldiers were killed, bringing the army's death toll to 20, and that 13 more militants were slain, bringing their death toll to 142. Reporters are blocked from entering the region, meaning verifying information is all but impossible. #5: A senior Afghan intelligence official says a military aircraft crashed in the country's northern region Thursday.Provincial intelligence chief Abdul Majid Azimi says the aircraft went down in the mountains of Afghanistan's Baghlan province. He says it is unclear if the aircraft involved is a helicopter or a plane or to whom it belonged.A spokesman for NATO's international coalition in Afghanistan (International Security Assistance Force or ISAF) says there were no immediate reports of a crash involving any of its aircraft. #6: Joint Afghan-NATO forces killed a number of suspected Taliban militants and wounded one in central Wardak province on Thursday, ISAF said. NATO is reporting the death of an American ISAF service member in an IED attack in an undisclosed location in southern Afghanistan on Wednesday, October 21th. #1: Two civilians were wounded on Thursday in a sticky bomb blast in western Baghdad, a police source said. “A bomb, stuck to a civilian vehicle, went off Thursday (Oct. 22) in al-Aamal al-Shaabi street in al-Aamiriya neighborhood, western Baghdad, injuring two civilians. #2: Two persons were wounded on Thursday in a bomb explosion in southeastern Baghdad, a police source said. “A sticky bomb, placed inside a civilian vehicle, went off Thursday afternoon (Oct. 22) in Jisr Diala region, southeastern Baghdad, killing a civilian and a policeman,” the source told Aswat al-Iraq news agency. #1: Two Iraqi soldiers were wounded when insurgents attacked their vehicles with small arms fire while they were patrolling an area near a village, located some 55 km north of the provincial capital city of Baquba, the source told Xinhua on condition of anonymity. #2: In separate incident, three people were wounded in gunfire erupted as the result of a dispute between tribesmen in a village west of Baquba, some 65 km northeast of Baghdad, the source added. #3: Also in the province, two members of an Awakening Council paramilitary group were wounded when gunmen opened fire on them at a checkpoint in the Edhiem area in northwestern Diyala, the source said. #4: The commander of the Sahwa fighters in Diala was wounded on Thursday in a sticky bomb blast in the south of Baaquba, according to a security source. “A bomb, stuck to the vehicle of the Sahwa commander, Sheikh Houssam Ulwan al-Majmaai, went off Thursday (Oct. 22) at the Bahraz district’s entry, south of Baaquba, seriously injuring him and one of his bodyguards,” the source told Aswat al-Iraq news agency. #1: At least two women were killed and 12 others were wounded in a sticky bomb explosion in the north of Hilla on Wednesday, a police source said. “A bomb, stuck to a bus, went off on Wednesday evening (Oct, 21) in Albu Ulwan region, Mahaweel district, north of Hilla, killing two women and injuring 12, including children,” the source told Aswat al-Iraq news agency. #1: Police forces found on Wednesday the body of a civilian one day after his kidnapping on the Tigris river’s bank in eastern Kut, a security source said. “Police forces found on Wednesday (Oct. 21) the body of a civilian one day after his kidnapping,” the source told Aswat al-Iraq news agency. “The body was found on the banks of the Tigris river in Anwar al-Sadr region, eastern Kut.” He added. Noting that it bore signs of gunshot wounds to the chest. #1: The U.S. base south of Nassiriya city was rocketed with three missiles on Wednesday noon, said a media source from Thi-Qar province. “The exact locations that were hit by the rockets are still unknown,” the source told Aswat al-Iraq news agency. He said that there have been no reports so far about casualties. Helicopters are still patrolling Nassiriya’s skies and nearby areas. #1: Rockets that hit the U.S. base southwestern Thi-Qar on Wednesday afternoon left minor damages, without causing any casualties, said the U.S. forces media spokesperson in the province. “Four rockets hit the base,” the spokesperson told Aswat al-Iraq news agency. He said one of the rockets hit the base’s surroundings. #1: A cameraman from an Iraqi satellite TV channel was killed and a journalist from another Iraqi channel was wounded by a roadside bomb explosion in the city of Kirkuk, a local police source said. "Orhan Hijran, a cameraman working for the al-Rasheed television, was killed and Mohammed Abdullah, a journalist with the al-Baghdadiyah channel, was wounded when a roadside bomb went off in the afternoon near their car in al-Khadraa district in southern Kirkuk," the source at Kirkuk police operations office, told Xinhua on condition of anonymity. #2: One civilian was killed Wednesday by gunmen in southern Kirkuk, according to a senior police official. “Unknown gunmen killed a civilian this afternoon (Oct. 21) in al-Asra neighborhood in southern Kirkuk using a gun with silencer inside his store,” Brig. Sarhad Qader, the Kirkuk Districts’ Police Department (KDPD), told Aswat al-Iraq news agency. #1: A vendor and a child were killed by gunmen in northern Mosul on Wednesday, according to a security source. “Unidentified gunmen on Wednesday afternoon (Oct. 21) opened fire on a vendor in al-Rashidiya region, northern Mosul, killing him and a 10-year-old passing child,” the source told Aswat al-Iraq news agency. #2: Gunmen opened fire on a civilian, who works for the water department, killing him instantly in al-Jameaa neighborhood, northern Mosul,” the source told Aswat al-Iraq news agency. #3: Another civilian was killed by gunmen in Senaat Wadi Ekab region, western Mosul, while driving his own car,” he added. #1: A Pakistani army brigadier and his driver have died in a shooting incident in the capital, Islamabad, police say. They were travelling in an army vehicle when it was attacked by gunmen. It is not clear who carried out the attack. The attack on Brigadier Moeenuddin and his driver Asghar took place in the G-11 sector of Islamabad. At least one soldier was injured. #2: At least 24 militants were killed during military operation in Pakistan's South Waziristan tribal area in the last 24 hours, while two security forces personnel lost their lives and four others were injured, an army statement said Thursday. #3: A roadside bomb struck an army van in southern Afghan Zabul province leaving two persons dead, both civilians, and injured nine others including seven civilians, police said Thursday. "The gruesome incident occurred Wednesday evening in Shahjoi district when device planted by militants hit a vehicle of Afghan soldiers killing two passersby and injuring nine others including two soldiers," Ghulam Jilani Khan deputy to provincial police chief told Xinhua. NATO is reporting the death of an American ISAF service member in an IED attack in an undisclosed location in southern Afghanistan on Tuesday, October 20th. Afghan war will destroy NATO: Hillier: (Hmm he doesn't mix words now does he.) The splits inside NATO over the Afghan war have turned the alliance into a rotting corpse that will be virtually impossible to revive, says the former head of Canada's armed forces. #1: Tuesday One woman was killed by a sticky bomb blast in al-Taaji region,” said the statement received by Aswat al-Iraq news agency. #2: update Three civilians were wounded when a roadside bomb targeted an American patrol in al Obaidi neighborhood in east Baghdad on Tuesday morning. 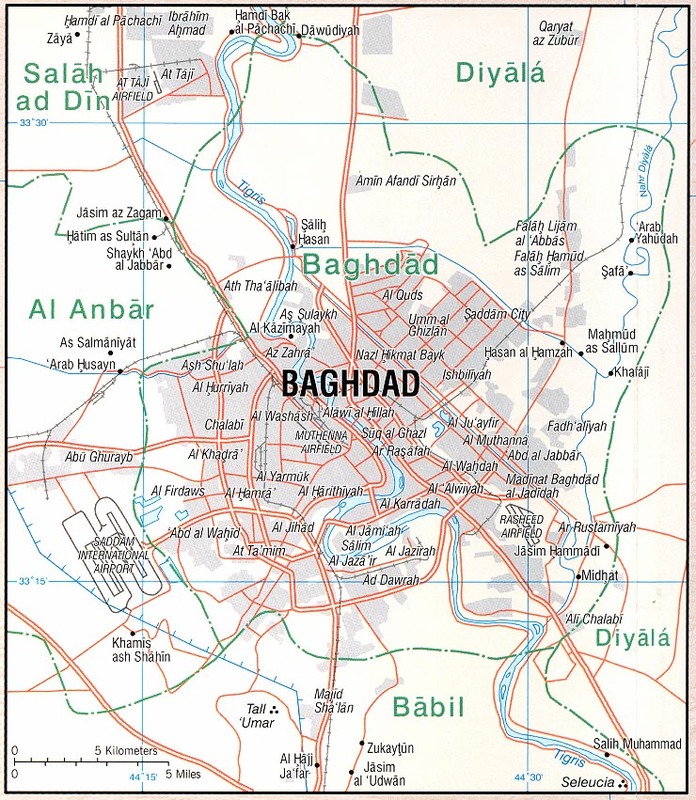 -- #7: A roadside bomb wounded three people in eastern Baghdad, police said. #3: A roadside bomb detonated targeting US military convoy in south Baghdad. No casualties were reported. #1: At least 12 people were wounded in a bomb explosion at a busy marketplace in a town in south of Baghdad on Wednesday, a well-informed police source said. The blast took place in the morning at a popular market in the town of Iskandriyah, some 40 km south of Baghdad, the source told Xinhua on condition of anonymity. #1: Turkish military aircrafts violated the Iraqi airspace in Qandeel mountain region and Bashdar district, northeast of Sulaimaniya in Kurdistan, according to the district’s mayor. “The Turkish aircrafts hovered Tuesday afternoon (Oct. 20) over Qandeel mountain region and Bashdar district, northeast of Sulaimaniya,” Hassan Abdallah told Aswat al-Iraq news agency. #1: Unknown gunmen kidnapped two school students on Tuesday in southwestern Kirkuk, a senior police officer said. “An armed group kidnapped two school students in al-Khadraa neighborhood in southwestern Kirkuk,” Colonel Adnan Mohammad Saleh told Aswat al-Iraq news agency. #1: A man and his wife were killed by armed men inside their house in south of Mosul city on Wednesday, according to a security source. “Unknown gunmen stormed a house in al-Bousef village, south of Mosul, at dawn, killing a man and his wife,” the source told Aswat al-Iraq news agency. “Their son is a policeman, which could be the motivation behind killing them,” he pointed out. #2: In eastern Mosul, gunmen opened fire on a man and his daughter in al-Jazaier district, the source said. #3: three policemen were injured Wednesday when an explosive device went off targeting a police patrol in al-Kokjali area. #1: One policeman was killed on Wednesday by unidentified gunmen in south of Falluja, a police source said. “Unknown gunmen opened fire on a police checkpoint on Wednesday morning (Oct. 21) in al-Shuhadaa neighborhood, south of Falluja, killing a policeman,” the source told Aswat al-Iraq news agency. #2: Armed men attacked an Iraqi army checkpoint and stabbed a soldier to death on Tuesday in central Falluja, 50 km (32 miles) west of Baghdad, police said. #1: At least three persons were killed in missile attack near Miran Shah, the chief town of the North Waziristan tribal region. The death toll could increase in the drone strike, local sources said. A foreign news agency citing intelligence officials said the drone-fired missile struck Spalaga, a village close to the border with South Waziristan, on Wednesday. An explosion at the home of a tribesman in Pakistan's militant-infested tribal belt killed three people Wednesday, security officials said. "There was an explosion in the house of Gharib Nawaz and three people died. Initially it was presumed to have been a U.S. drone attack but it's not a drone. It was an explosion in the house," one senior security official said. The incident happened in the mountains of Spalga about 10 kilometers southeast of Miranshah, the main town in North Waziristan. #2: Pakistani soldiers fighting inside the hometown of the Pakistani Taliban leader gained ground Wednesday as they pressed ahead with a major offensive on a militant sanctuary close to the Afghan border, intelligence officials said. Troops had secured parts of Kotkai town and destroyed the home of Pakistani Taliban chief Hakimullah Mehsud by Wednedsay, but battles were ongoing, two officials told The Associated Press on condition of anonymity because they were not authorized to speak to the media. Pakistani security forces killed 15 more militants during the last 24 hours as the operation in the country's tribal area pushed further towards the Taliban strongholds in South Waziristan, the amy said Wednesday in a daily press release. The army said three security forces personnel including an officer were killed and seven others were injured in separate clashes in the last 24 hours during the ground assault in various areas in the tribal agency near the border with Afghanistan. #3: An Australian soldier in Afghanistan has gone temporarily deaf from the blast of an insurgent improvised explosive device (IED) earlier this week. Defence said the unnamed soldier was involved in one of three IED incidents on Monday. Those blasts killed one Afghan National Army (ANA) soldier and wounded another. Defence said the soldier had been participating in a mentored patrol involving the ANA and Australian and coalition soldiers. DoD: Staff Sgt. Glen H. Stivison, Jr.
DoD: Spc. Jesus O. Flores, Jr.
DoD: Spc. 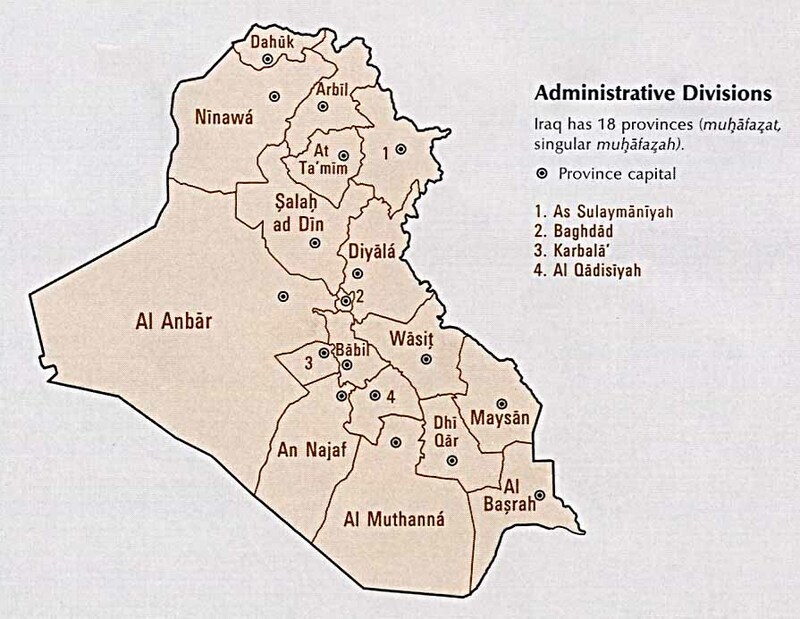 Michael A. Dahl Jr.
MNF-Iraq is reporting the death of a Multi-National Division - North soldier in a roadside bombing in Ninawa province on Monday, October 19th. Two additional soldiers were wounded in the blast. #1: A car bomb in western Iraq killed four people on Tuesday while an explosion on a bus in northwestern Baghdad killed one person, police said. #2: Minutes later, a roadside bomb targeting a police patrol in western Baghdad wounded three civilians, a local policeman said. The policeman and the two officers all spoke on condition of anonymity because they were not authorized to release the information to media. #3: A civilian was killed and eight others were wounded when a bomb detonated inside a bus in Shaab neighborhood in north Baghdad aroud 3 p.m. Monday. #4: Three people including a policeman were injured by a roadside bomb that targeted a police patrol in Maisaloon intersection inKarrada neighborhood around 8 p.m. Monday. #5: A roadside bomb injured two civilians in northern Baghdad, police said. #6: A bomb attached to a minibus wounded three civilians in northern Baghdad, police said. #7: A roadside bomb wounded three people in eastern Baghdad, police said. #1: One officer was killed and three policemen were wounded Tuesday when an explosive charge went off targeting their vehicle patrol in northwest of Hilla, a police source said. “A local-made bomb went off on Tuesday (Oct. 20) targeting a police vehicle patrol in al-Hamiya region, al-Mussayab district, northwest of Hilla, killing an officer and injuring three policemen,” the source told Aswat al-Iraq news agency. #1: Police forces seized in Basra on Tuesday three Katyusha rockets and six launching pads ready to launch on the province’s two factories of gas and petrochemicals. 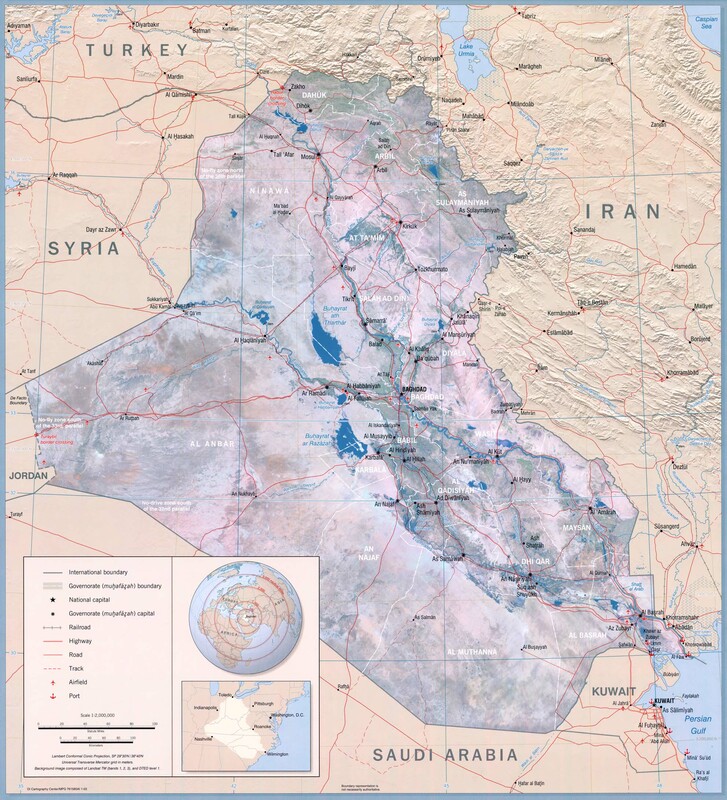 “The forces launched security raids at the al-Rafdhiya area, 60 km west of Basra, relying on intelligence tip off,” a security source from the province told Aswat al-Iraq news agency. #1: Iraqi army forces killed a gunman after clashing with him in western Mosul on Monday, a police source said.“An army force killed the gunmen, with whom it clashed with at al-Islah al-Zeraie neighborhood, western Mosul,” the source told Aswat al-Iraq news agency.“The force killed the gunman after opening fire on a soldier and wounding him,” he explained.He did not add further details. #2: Police forces found on Tuesday two unknown corpses in southeastern Mosul, according to a security source. “Policemen found on Tuesday morning (Oct. 20) two unidentified corpses on the public street at al-Wehda neighborhood in southeastern Mosul,” the source told Aswat al-Iraq news agency. “The two corpses belong to young men; 25 and 30,” he added, pointing out that they were choked to death. #3: A roadside bomb wounded two Iraqi soldiers when it struck their patrol in western Mosul, police said. #1: A dynamite-laden car parked at a gas station detonated during morning hours in the town of Saqlawiyah, 45 miles (75 kilometers) west of Baghdad, killing three policemen and one civilian, a local police officer said. He said five policemen and one civilian were wounded in the same blast. #1: Two suicide attackers bombed a women's cafeteria and a faculty building at an Islamic university in the Pakistani capital Tuesday, killing two people and wounding 20 others, authorities said. At least two people died and 20 were wounded, he said. Both attackers were also killed. #2: The army on Monday captured the small town of Kotkai, the birthplace of Pakistani Taliban chief Hakimullah Mehsud on the approach to an insurgent base in south Waziristan, but militants struck back on Tuesday to retake it, security officials said. "Seven soldiers, including a major, and several Taliban were killed in the fighting," an intelligence official in the region told Reuters. Another intelligence official said jets bombed Taliban positions in and around Kotkai after the militant counter-attack. The militants have had years to prepare their bunkers, but the army says it has surrounded the entire militant zone and was attacking from the north, southwest and southeast. #3: Six more extremists have been killed and 11 others wounded in ongoing operation Rah-e-Nijat in Northern Waziristan Tuesday. Gunship helicopters, jet planes and ground troops are taking part in the operation. According to sources, security forces are advancing to extremists bases in Makeen and Ladha from the area of Razmak. Extremists death tally has mounted to over 80 and more than 30 hideouts have been destroyed in the continuing operation for last four days, state sources added. MNF-Iraq is reporting the death of a Multi-National Division - North soldier in a vehicle accident five miles west of Mosul on Sunday, October 18th. Two additional soldiers were wounded in the incident. NATO is reporting the death of a U,S. soldier in a roadside bombing in an undisclosed area of southern Afghanistan on Sunday, October 18th. #1: A civilian was killed and ten others injured in a bomb explosion inside a snack restaurant in southern Baghdad on Monday, a well-informed police source said. The blast took place in the Shatt al-Arab restaurant in the Eshreen thoroughfare in Baiyaa neighbourhood around midday when a home-made bomb detonated, the source told China's Xinhua news agency on condition of anonymity. The police believe that the bomb was left by a customer who sneaked out of the restaurant before the explosion. #2: Five civilians were killed and 15 others were wounded when a parked car bomb detonated in Raghiba Khatoon area, part of Athemiyah neighborhood northeast Baghdad around 6 p.m. Sunday. #3: A bomb attached to a car killed one person and wounded three others in central Baghdad's Karrada district, police said on Sunday. #4: A bomb planted in a bus killed one person and wounded eight in Shaab district in north Baghdad, police said. #1: Two border guards were wounded when a clash broke out between them and members of Iraqi army in Khanaqin town northeast of Baquba on Sunday. #2: A roadside bomb targeted a civilian car in the town of Shahraban, 36 km to the east of Baquba, Monday, killing the civilian driver. #1: A roadside bomb killed two people and wounded nine in Haswa, 50 km (30 miles) south of Baghdad, police said. #1: A bomb attached to a police colonel's vehicle wounded two of the officer's bodyguards in central Kirkuk, 250 km (155 miles) north of Baghdad, police said. #1: Gunmen assassinated the director of the clans’ affairs office director in northern Mosul city on Monday, according to a local police source in Ninewa. “The gunmen opened fire on Monday morning at Brig. Zhannoun Ballou in front of his house in al-Hadbaa neighborhood, northern Mosul, just as he was heading for work,” the source told Aswat al-Iraq news agency. Ballou, a former Iraqi army officer, was a senior military official in Ninewa. He had received the duties of his post as the al-Hadbaa list received the province administration in mid-April after winning the provincial council election early this year. #2: The director of the Talabta district survived an attempt on his life when an improvised explosive device blast targeted his motorcade in western Mosul on Monday, a local police source in Ninewa said. “An IED went off near Abdulrahman Khalid Jassem’s motorcade in al-Yarmuk neighborhood, western Mosul, causing damage to the vehicle he was boarding but he survived unscathed,” the source told Aswat al-Iraq news agency. #3: A bomb attached to a car injured two construction workers in northern Mosul, 390 km (240 miles) north of Baghdad, police said. #4: A mortar round landed on an Iraqi army recruiting station, wounding four people in northern Mosul, 390 km (240 miles) north of Baghdad, police said. #5: An unknown gunman shot and wounded a civilian walking on a street in eastern Mosul, police said. #6: Insurgents threw a hand grenade at a U.S. military convoy in Wadi Hajar, southern Mosul. No casualties were reported. #1: The first blast was of a car bomb in Kharma town, Fallujah City in Al-Anbar Province in the west of Iraq. The blast killed two people and injured another five. #2: A car bomb targeting a police patrol wounded four policemen in Garma, 30 km (20 miles) northwest of Baghdad, police said. #1: On Monday, Taliban militants set fire to 15 trucks carrying supplies to a military base in eastern Ghazni province, according to local official Sahib Khan. Afghan security guards killed two militants during the fighting. #2: Two Afghan security troopers were killed in a gun battle overnight with Taliban fighters near Ghazni city, provincial spokesman Ismail Jahangir said. #3: Troops fought militants on three fronts and fighter jets bombed insurgent positions near the Afghan border Monday as Pakistan pressed ahead with an assault on the country's main Taliban and al-Qaida stronghold. Intelligence officials said fighting was going on Monday close to Jandola, Razmak and Wana, three towns where the army has bases. Jets were making bombing runs in the Ladha and Makeen areas, the officials said. The army said Sunday that 60 militants and six soldiers have been killed since the offensive began Saturday. Intelligence officials said eight more militants were killed Monday as they advanced on troops in the Khaisur area. #4: As many as 150,000 civilians - possibly more - have left in recent months after the army made clear it was planning an assault, but some 350,000 people may be left in the region. Authorities say that up to 200,000 people may flee in the coming weeks, but don't expect to have to house them in camps because most have relatives in the region. Stick bomb attack kills a civilian man near Baghdad University. Xinhua identifies the man as a government employee and says 3 colleagues were injured. Roadside bomb injures 3 people in southwestern Baghdad. Bomb in a restaurant kills 1 civilian, injures 10. Bomb hidden in a garage kills 1, injures 9. Vacationing policeman survives sticky bomb attack. CEO of a cement company is injured in a roadside bomb attack. Attack on a police checkpoint results in death of 1 child, 5 injured civilians. Heavy fighting continues in South Waziristan as Pakistani Army attempts to drive out militants. Pakistan claims to have killed 60, and to have suffered 6 dead. Taliban claim to have pushed invading army back to its bases. The region is closed to reporters and no independent reporting is possible. ISAF reports a U.S. military death in southern Afghanistan. No further information is available. Joint NATO-Afghan operation in Uruzgan province said to kill 8 militants. This incident in Iran may suggest the Afghanistan conflict is spilling over into that country. -- C The deputy commander of the Revolutionary Guard's ground force, Gen Noor Ali Shooshtari, as well as a chief provincial Guard commander are among 5 killed and 15 injured in a suicide bomb attack in Iran near the border with Pakistan. The area has been the scene of attacks by a Sunni militant group called Jundallah which has also attacked a Shiite mosque. That's why I'm blaming the United States. I fought with them in the same trenches, but they are not supporting us politically. Everyone thinks about their self-interest. Nobody thinks about Iraq first. "Awakening" movement leader Mustafa Kamal Shibeeb, candidate for Parliament and fugitive from murder charges. The Washington Post is reporting the deaths of 3 U.S. ISAF service persons in an IED attack in an undisclosed location in eastern Afghanistan on Friday, October 16th. The Washington Post is reporting the death of another U.S. ISAF service persons in an IED attack in an undisclosed location in southern Afghanistan on Friday, October 16th. #1: A bomb attached to the car of an Interior Ministry officer wounded the official and one civilian in the Yarmouk district of central Baghdad, police said. #1: Two gunmen where killed on Saturday while attempting to plant a roadside bomb southwest of Kirkuk city, and two civilians were wounded in the resulting blast, said a security source from Kirkuk. #1: On Saturday, attackers targeted an Iraqi army patrol near Kirkuk, 180 miles (290 kilometers) north of Baghdad, killing two civilians, a police official in the oil-rich city said. Two civilians were injured in the hand grenade attack, which left the soldiers unharmed, he said. 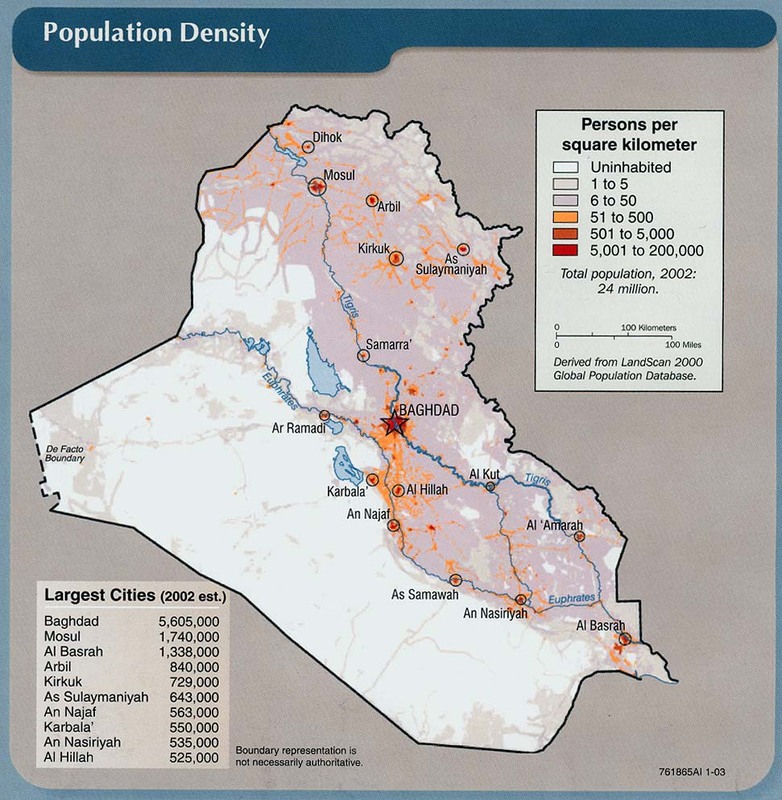 #1: In Mosul, 225 miles (360 kilometers) northwest of Baghdad, a gunman killed a policeman and three bystanders Saturday, police said. #2: Policemen killed a woman and wounded two civilians in western Mosul city by mistake on Friday, a local police source said. “National Police personnel opened fire at an ambulance carrying a sick women in the area of Dorat Qassem al-Khayyat, western Mosul, by mistake when the ambulance was driving by fast and ignored orders to stop,” the source told Aswat al-Iraq news agency. “The sick woman was killed and two civilians escorting her were wounded in the incident,” he added. #3: A roadside bomb targeting an Iraqi police patrol killed one policeman and wounded two civilians in western Mosul, police said. #1: A suicide bomber driving a dynamite-laden truck destroyed a key bridge Saturday on a highway used by the departing U.S. military. A U.S. military spokesman in Iraq's western Anbar province, where both Ramadi and Fallujah are located, confirmed Saturday's explosion on the highway bridge outside Ramadi, close to two Iraqi military bases that host U.S. troops in the area. #2: The incident came a day after gunmen blew up a wooden bridge south of Falluja connecting Ameriyat al-Falluja and Abu Ghraib towns near the Euphrates river. #3: Four Iraqi policemen were killed and 10 injured Saturday when a bomb targeted their truck near the Iraqi city of Falluja, security sources said. #4: One policeman on Saturday was killed and two others were wounded in an explosive charge blast in southern Falluja, according to the local police. 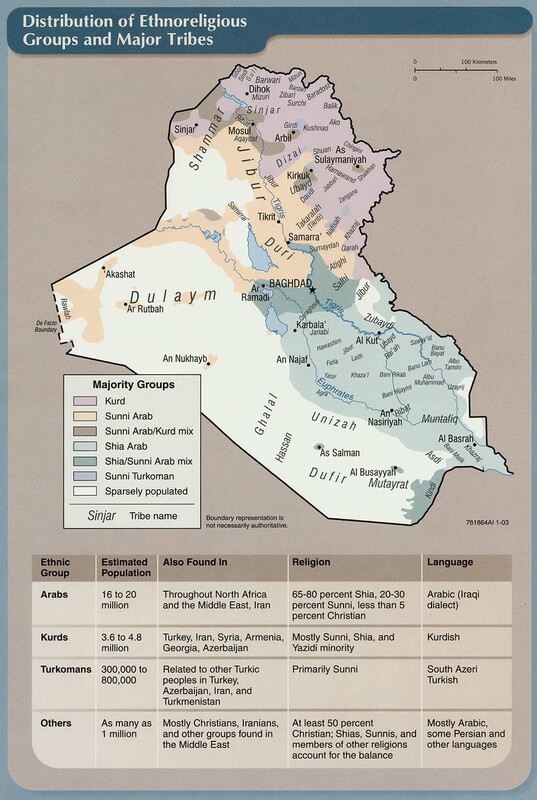 “Today, an explosive charge went off in al-Ameriya district, southern Falluja, killing one patrolman and wounding two others,” a police source told Aswat al-Iraq news agency. #5: Unidentified gunmen on Saturday blew up the house of a police officer in Anbar province, according to a police source. “Unknown gunmen planted explosive devices and an amount of TNT explosives around the house of a cop in al-Aameriya district, southern Falluja,” the source told Aswat al-Iraq news agency. #1: Meanwhile, Afghan and NATO forces killed 20 Taleban militants in Urgon district of southeastern province of Paktika on Friday in an operation in which an airstrike was also used, Hamidullah Zewak, a spokesman for the provincial governor said. Mullah Ismail, one of the Taleban district level commanders was also among those killed, he said, adding that no Afghan or foreign troops were killed in the firefight. #2: Another five militants were killed in an Afghan army commando operation in Gerishk district of southern province of Helmand, Afghan defence ministry said in a statement. The forces arrested two other militants during the operation, it said. #3: More than 30,000 Pakistani soldiers launched a ground offensive against al-Qaida and the Taliban's main stronghold along the Afghan border Saturday, officials said, in the country's toughest test yet against a strengthening insurgency. #4: At least 11 suspected insurgents were killed in the jet bombings, while a bomb hit a security convoy, killing one soldier and wounding three others, two local intelligence officials said. #5: At least 20 Taliban militants were killed in air strikes on the militants' hideout in Afghanistan's eastern Paktika province, authorities said Saturday. #6: Eight Afghan National Police (ANP) were wounded on Saturday as their van hit a roadside bomb in Paktia province of eastern Afghanistan on Saturday, police said. "The incident occurred at around 10 a.m. local time (0530 GMT) in Ibrahim Khil area near the capital city Gardez when an ANP unit was on routine patrol by their vehicle," deputy to provincial police chief Ghulam Dastgir Rustamyar told Xinhua. Three of the eight wounded are in critical situation, he added. #7: In separate incident, 10 villagers who were busy in reconstructing road were kidnapped by Taliban militants in Waza Zadran district of Paktia province in eastern Afghanistan Saturday morning, district chief Abdul Wali Zadran told Xinhua. However, Taliban militants told media via cell phone from undisclosed location that 15 villagers, who have not heeded the warning of outfits, have been made captive.